Henry Alderson (Service No 1702) was born in Woonona, NSW. At enlistment Henry was single, 21 years old, worked as a builder and had served in the cadets. Henry enlisted at the same time as his brother Frank (Service No 1703) and they stayed together for the early part of the war. Henry embarked on HMAT A9 Shropshire with 4th Reinforcements, 13th Battalion on 17th March 1915. After he arrived in Egypt he was sent to Gallipoli with C Company until he was evacuated to hospital sick on 21st August 1915. He was sent to England suffering from pleurisy and enteritis, arriving on 2nd October 1915. Henry's health did not allow him to return to the front and he saw service in England till the end of the war. On 1st January 1918 Henry was promoted to Corporal and on 20th September 1918 promoted to Sergeant. 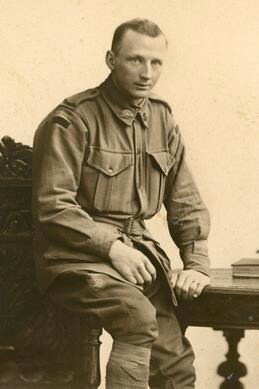 Henry returned to Australia in March 1919 and was discharged medically unfit on 25th June 1919. He married Hilda Cherrington on 18th October 1920 and they had 3 children. Henry died at Westmead in 1980 aged 87. His other brother, Charles Stanley - aka Harold Palser (Service No 2955) also served. Thank you for your comment on my grandfather Henry Alderson. We have copies of letters written by a Henry and a Frank while overseas in WW1. Their younger brother Stanley tried to enlist with his older brothers but was refused as he was only 16 years old and too young to qualify for service. Stanley tried again by convincing his aunt to falsify his age, and he changed his name, by taking on the name of a workmate Harold Palmer, who was 18 years old. He did not have a brother Charles, as in your comments. My father Albert Henry Alderson is sitting next to me, born 14 December 1924 and is the son of Henry and Hilda. Henry and Hilda had three children Pheobe Maude (1921 to 1972), Albert Henry (1924) and Kennith Clarke (1927). Henry returned home to Sydney with his brother Frank and they restarted their building business, Alderson Brothers, until Frank died in 1929. The business was then closed and Henry became a poultry farm at Old Toongabbie. Thank you for you contribution to the Illawarra Remembers website. In respect to your comment above about Henry Alderson not having a brother Charles - all documentation (which has now been updated) shows that Henry had a brother Charles Stanley who enlisted under the alias Harold Palser. From the documents (which you can view by clicking on the links), it would appear that the family knew Charles as Stanley. Links have also been made between the brothers so you can now click on the highlighted names to view each individual profile.